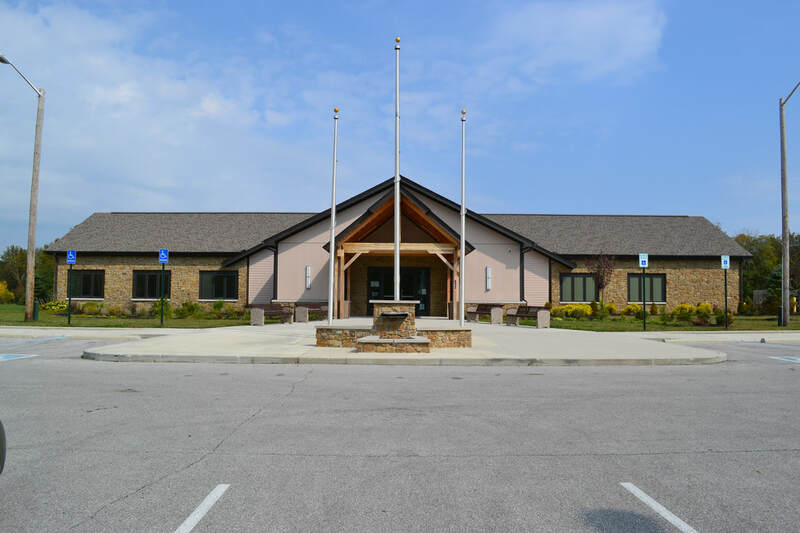 Washington Township Park boasts the first Dog Park in Hendricks County, aptly named “Paw Park.” The facility is located on C.R. 575 East, just off of US 36. 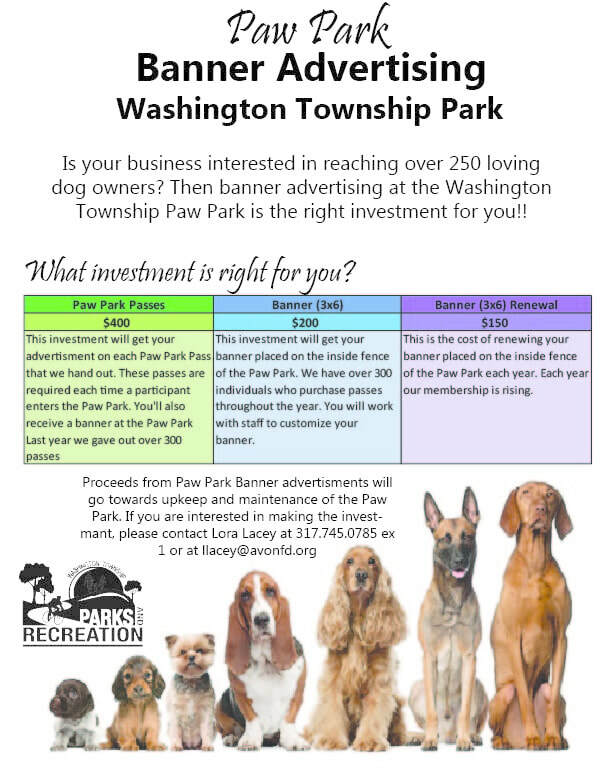 The Paw Park was designed to give the Washington Township community an opportunity to exercise and socialize their dogs in an off-leash area. All dogs are required to have a Paw Park membership to use the area. Coming 2019 water supply to be added to the paw park. Woofstock has raised funds for us to begin this much needed addition to the Paw Park. Mark your calendars for to the 2019 second annual Woofstock on 8/10/2019. Before you get a pass, please create an account and fill out the Paw Park application online. Paw Park memberships and renewals can be purchased through the website or Monday through Friday 8:00am-4:30pm from the Park Office. All passes will need to be picked up in the Park Office located in the Pavilion Center. Washington Township Park and a committee of Paw Park enthusiasts have joined together to present Woofstock. Woofstock will be a one day fundraiser to make updates to our existing Paw Park. We are working to add capital improvements, agility equipment, and water features to the park. If you are interested in joining the committee and would like to learn more, please fill out the form below. The success of the Paw Park is dependent on the compliance and self-monitoring of the following rules:• Dog's "in heat", ill, or injured are not permitted in the Paw Park. • Handlers* are legally and personally responsible for all damage / injury caused by their dog. • Handlers* must carry a leash and pick-up baggies or other clean-up devices at all times. • Be cautious with dog toys; some dogs don't like to share. • Dogs the demonstrate aggressive behavior towards people and/or other dogs should be leashed AND removed from the park immediately. • Handlers* may use only bite-sized treats in Paw Park. Do not feed treats to other dogs without owner's permission! • No pets other than dogs are permitted in Paw Park. • Handlers* must stop their dogs from digging and immediately fill in all holes. • Dogs must be leashed when entering & exiting the Paw Park and must be leashed at all times outside the Paw Park. • Paw Park is subject to patrol by animal control and park staff. • Access to Paw Park will be restricted during select special events and periodic maintenance. If restricted, notification will be posted. • Allowing others to enter the Paw Park under your card number- Member and/or non-members is prohibited. • Children under the age of 12 are not permitted in the Paw Park unless accompanied by an adult. Handlers* may not bring more than two dogs. • Professional dog trainers may not use this area to conduct business. • Handlers* must monitor their dog's behavior and stay within view of pet at all time. * A Handler is defined as anyone, owner or other, responsible for a dog or dogs utilizing the Paw Park. ** These rules are subject to change without notice.